Horse-Advice.com is a web based horse care magazine produced to help you to provide the best care for your Pony or Horse. We have articles about traditional veterinary treatments and alternative equine and holistic therapies for your horse to help you to keep your horse or pony in top condition and fitness. We have advice and articles on diseases that affect many horses such as Mud Fever and the best treatments that are available to tackle these problems. Horse insurance is important and we discuss Horse Insurance Policies that will help you to cover the cost of veterinary treatment for your horse and also cover you for liability should your horse damage any property or hurt someone. We give advice on best feeding practices and adding supplements to a horse's diet. For example - why you should ensure that your pony or Horse has Salt in its diet. Choosing the best saddlery and bitting a horse correctly is very important for the comfort of your horse and we have articles to help you in these issues. It is always wise to consult your veterinary surgeon, especially in an emergency, but these pages aim to give you an insight and reference to the different equine therapies, feed supplements, veterinary treatments, training methods and saddlery that are available for your horse or pony. Massage is an ancient therapy that has been used to treat horses for many hundreds of years. There are many forms and types of equine massage, all providing numerous benefits to the horse. The different massage techniques are designed to release muscle tension, improve circulation and increase the range of motion in the horse. 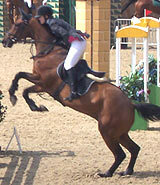 Performance, stamina and the quality of the horses stride are also often improved as a result. Horse owners will often that their horse is much more relaxed and in a calmer frame of mind following a course of massage treatments from a professional equine therapist. A correctly and properly fitted saddle is essential to the performance and comfort of a horse or pony. Computerised saddle fitting is a new high tech way to achieve a correctly fitted saddle. Read how this gives horse owners an accurate record of how their saddle fits. We have articles on bitting, including advice on how to select, fit and use hackamore bridles , Eggbutt Snaffles and pelham bits . Homeopathy is an alternative therapy based on the use of refined dilutions of natural substances such as Arnica to trigger a healing response in the horse's body. The basic principal of homeopathy is that any substance that can cause a disease, can also be the principle cure - "like cures like". Homeopathy can be used for all types of conditions that affect horses including Ringbone, Bruised Soles and Colic.